An aromatic, herbal omelette with crispy edges provides a feeling of fullness for hours. One serving is only 112kcal, and 1g of carbohydrates, and at the same time as much as 18g of protein! Do you train intensely? You are on a diet? 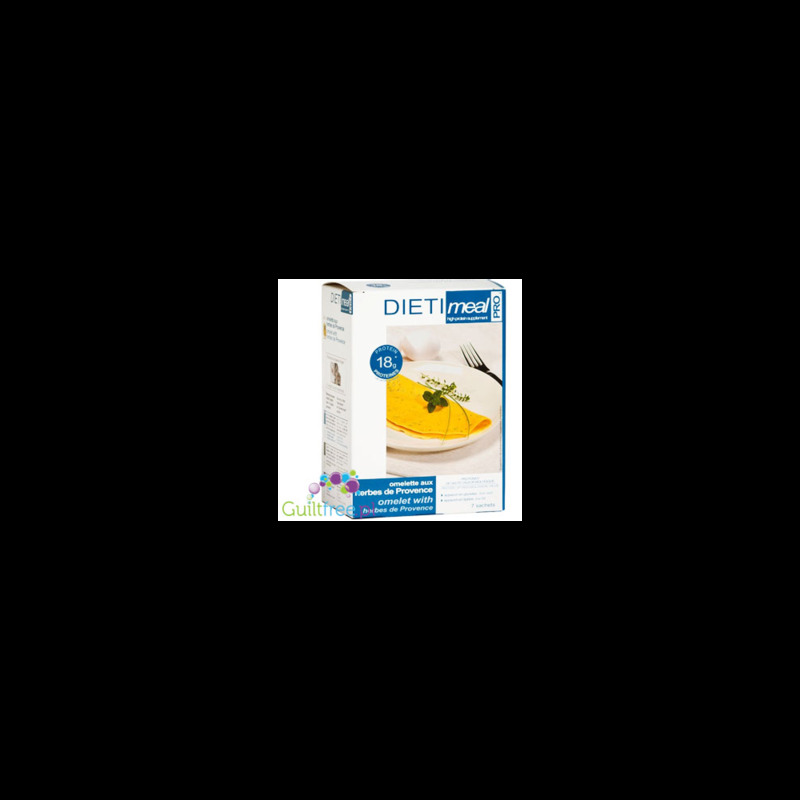 DIETImeal PRO DIET is the perfect breakfast for you! Weight net. 28g. 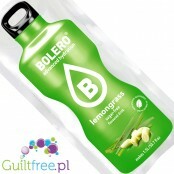 ; 18,18 pln/100g. 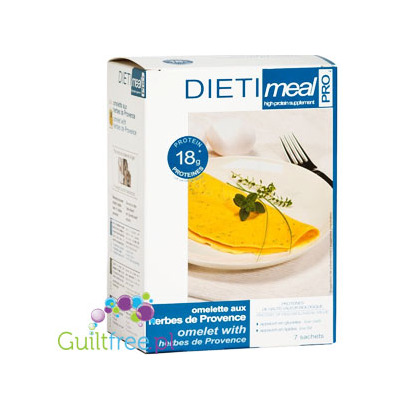 Mix the contents of the sachet with water, heat in a pan - after a minute you will be delighted with the taste of a delicious herbal omelette with Herbes de Provence and parsley. The portion will give you energy and hunger for long hours. A perfectly composed and balanced composition of a high-protein omelette is the minimum amount of calories and the maximum feeling of satiety. Sprinkle the pieces of ham and pour the sauce Alfredo Walden Farms - the possibilities are infinite and everything depends on your fantasy! One serving is only 112 kcal, and just 1g of carbohydrates, and at the same time as much as 18g of protein! Do you train intensely? You are on a diet? 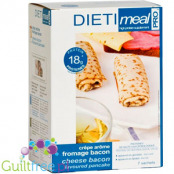 The DIETImeal PRO cheese omelet is the perfect breakfast for you! 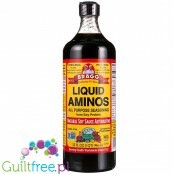 Allergens: the product contains milk, eggs and soy; it may contain traces of gluten, celery and sulfites. 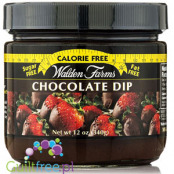 Quantity (portion) necessary to obtain the product's beneficial effects: 28g. A balanced way of nutrition and a healthy lifestyle are the basis for the proper functioning of the body. Preparation: Pour the contents of the sachet into the bowl, slowly stirring, pour 80-100ml of cold water, stir constantly until the product dissolves. Season to taste with salt, pepper and herbs or spices. Heat the non-stick pan with a small amount of fat. Pour the mass of omelette into the pan, fry 20-30 seconds. You can beat up to get high-protein scrambled eggs. To obtain a more fluffy consistency for the last 10 seconds of frying, cover the pan with a lid. For optimal taste and consistency, it is best to eat directly after cooking. A cappuccino coffee aroma. Capella Flavors are considered to be the best in the world - these highly concentrated flavors are versatile and water-soluble. Capella flavors do not contain sugar, fat or sweeteners. 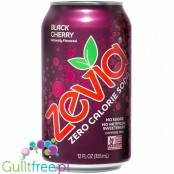 Zevia Black Cherry - refreshing taste of ripe cherries in 100% natural zero calories! 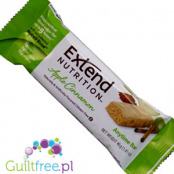 Sweetened with natural plant steviastevia Zevia Black Cherrynot only tastes delicious but does not provide calories and has a natural, healthy composition. Sweet soda is delicious - thanks to Zevia they are also healthy and natural! 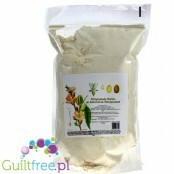 Krunchy Melts low-calorie vanilla mousse is sweetened with stevia - neither sugar nor fat. They delight in the classic taste of perfect chocolate, and according to their name, they are crisp on the top and crunchy in the middle - melted in the mouth. A handful of greens contain only 30kcal - they have almost half the calories than regular meringues!